Fort Wayne, Indiana – A patent and copyright attorney for Lake Lite Inc. of Laotto, Indiana filed a complaint in the Northern District of Indiana asserting, inter alia, that Universal Forest Products, Inc. of Grand Rapids, Michigan (“UFP”); Universal Consumer Products, Inc., also of Grand Rapids, Michigan (“UCP”); and Maine Ornamental, LLC of Greene, Maine infringed “Solar Dock Light” and “Low Profile Solar LED Lamp,” Patent Nos. D697,246 and 8,845,126, which have been issued by the U.S. Patent Office. Lake Lite is in the business of designing and selling dock lights and other related products and accessories in the boating/dock industry. 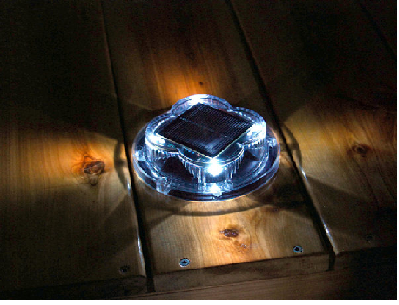 Its product line includes solar-related dock lights. In April 2012, Lake Lite first began to offer a “Solar Dot” line of products. Lake Lite indicates that UFP inquired about collaborating with Lake Lite to offer the Solar Dot products to UFP’s customers and that, in November 2012, a mutual non-disclosure agreement was entered so that confidential information regarding Lake Lite’s Solar Dot products could be disclosed and the potential collaboration evaluated. The disclosed information included Lake Lite’s copyright applications to now-copyrighted materials, registered as U.S. Copyright Nos. VAu001118627 and VAu001156962. In this Indiana copyright and patent litigation, Plaintiff Lake Lite’s specific complaints include that Defendants have been unjustly enriched as a result of their manufacture, importing, marketing and sale of their solar deck and dock light products. Lake Lite contends that Defendants’ acts include infringement of Lake Lite’s copyrights and patents, unauthorized use and misappropriation of Lake Lite’s confidential information and trade secrets and violation of the mutual non-disclosure agreement between Lake Lite and UCP. Lake Lite asks for a judgment of infringement of its copyrights-in-suit, of infringement of its patents-in-suit, that the non-disclosure agreement was violated by Defendants, that Defendants violated the implied duty of good faith and fair dealing in their dealings with Lake Lite regarding the Solar Dot products, that Defendants have misappropriated Lake Lite’s trade secrets and that Defendants have been unjustly enriched. Lake Lite seeks injunctive relief; damages, including punitive damages; costs and fees, including attorneys’ fees. The suit was filed by M. Scott McIntyre of Baker Hostetler LLP. The case was assigned to Judge Jon E. DeGuilio and Magistrate Judge Roger B. Cosbey in the Northern District of Indiana and assigned Case No. 1:14-cv-00337-JD-RBC.